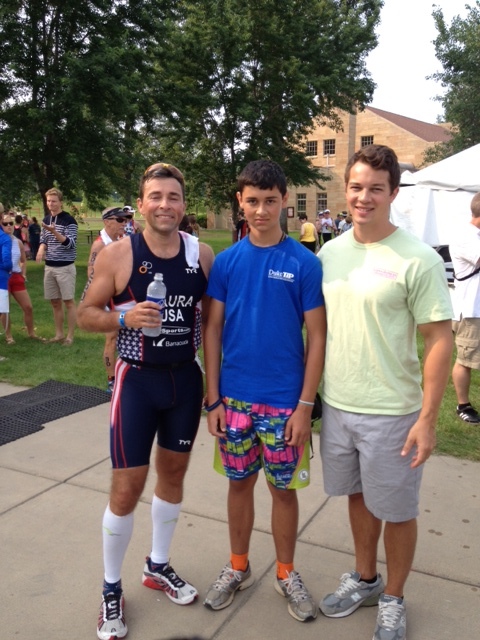 Duathlon Nationals, 2014: Family included. Going into last year’s event, I had problems. Injury and a lack of confidence were both preventing me from going all-in on my effort. Heck, I almost dropped out. 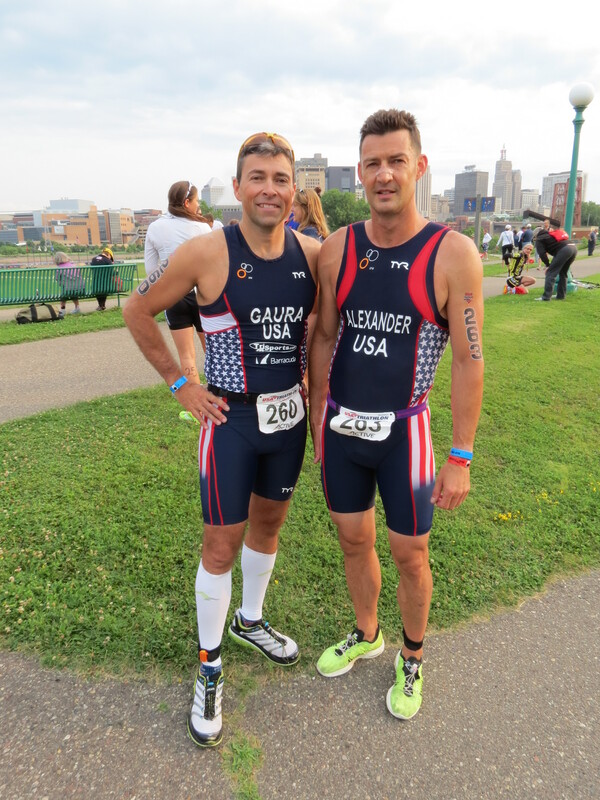 This last weekend in St. Paul, MN, I lined up to compete again, but this time, my foot was working at 100%…that meant no difficulties, and I was much better prepared than the last year or even two months ago. I had already ridden the course and knew what I had to do to be successful. After completing Spain in less than ideal conditions, I knew I was ready for this race. Confidence was high, I was hydrated and had a great night’s sleep. It was a day to remember. This race included my extended family in the audience. My wife, son Alex and I drove up from NC, and those two dropped me off at the race hotel to pick up my stuff and meet my friend Mike, so we could ride the course together. It was enjoyable to catch up with him as well several others from the TeamUSA community. Seeing each of them required that I put on my teacher hat and remember their names, where they were from and one anecdotal tidbit of data about them. 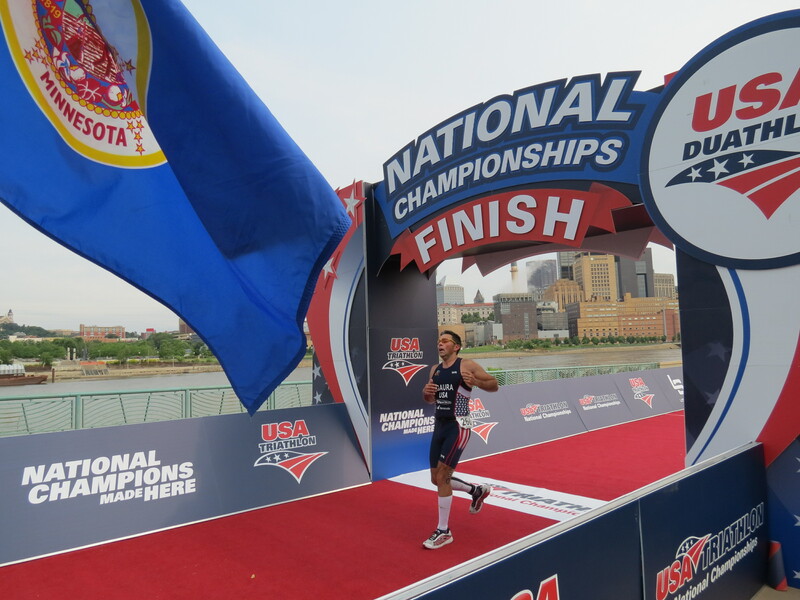 We are all known as great athletes in our hometowns, but remembering the name of the hometown…now that was the challenge! Examples include: Kristen Wetzel whose name sounds like pretzel, from WVA. Martha from Cleveland whose boyfriend is a dud. Eileen the Pilates lady. Glen, the lighting fast guy from Cornelius, NC whose sister lives in Chicago. And the list goes on. All in all, I spent over an hour at pre-race check in, and I never talked to anyone more than 5 minutes nor spent more than a minute alone. TeamUSA is a community inside of a community. Marcus Alexander, whose background includes life in the UK, USA and Luxembourg. In all, nine family members were there to see the race. Neither my children nor any of my parents had ever seen me race, and my wife has only seen me race once. I told a few folks this story and they asked if I felt pressure to perform. “Not really. I am more ready for this race than I was for Spain!” I told them. My sons were there at the starting line, and my wife, mother-in-law and brother-in-law were all at the one mile point on the run. They all moved to the bike course and saw me go by 6 times as I did three loops in downtown St. Paul. My wife and sons were all there at the finish line to see me cross, and most of the photos in this blog came from Michael, my oldest. I knew when I crossed the finish line that I had done well. After the race, as I reviewed the numbers, I was pleased at my progress. My first run was 31 seconds per mile faster than Spain. The bike was 20 seconds per mile faster than Spain. My second run was 34 seconds per mile faster. What a difference training, nutrition and a cortisone shot can make! Walking to the results table, I felt that I was about to learn that I locked in a spot on TeamUSA for 2015, so long as I didn’t get any penalties. To say that I was shocked when I saw that my national ranking had dropped would be an understatement. I was better in all categories. Mike Lupini and I both reviewed our numbers together, and it didn’t make me feel any better. He locked his spot in Australia, and I was going to have to wait a week or two before getting my formal invite. Everyone encouraged me and reminded me that I would get a slot, but I still wanted to celebrate my success with everyone, while I was still there. My body felt different after this race. Last year, I was exhausted and took a pain killer and slept on the ride from Tucson back to Scottsdale. This year, I felt rested and ready to go. The next am I went on a 2 hour bike ride, and there was nothing to report….all was good. 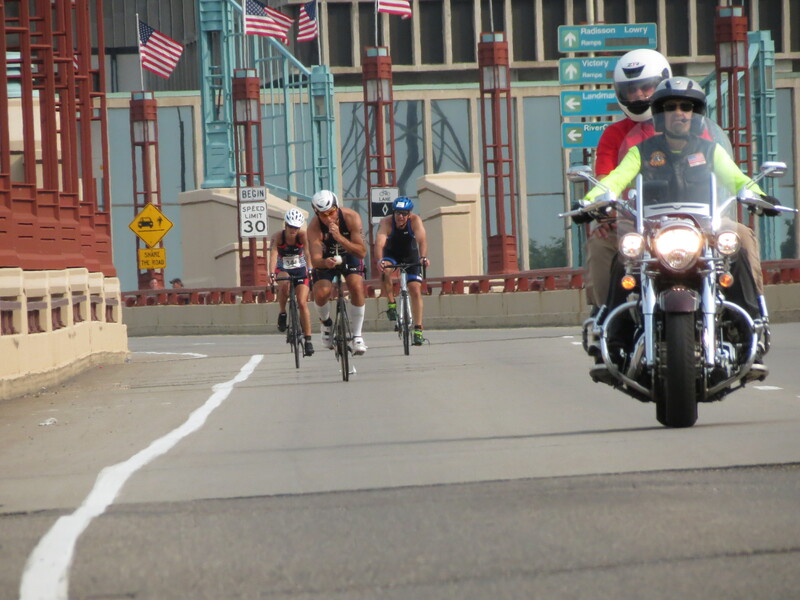 Climbing the bridge over the Mississippi river with a USAT official, on a motorcycle in front of me. After the race, we piled in a couple of cars and drove to a rental house outside of St Paul and had some family time for the next few days. We spent time together playing games, fishing, walking, eating and just hanging out. We celebrated three different birthdays. Since Worlds are more than a year away, I am taking an all-star break, as Sharon and Dave Koontz call it, and I am not tracking nor monitoring my exercise efforts for a couple of weeks. I will still run and bike, but not to get better or faster….I will go back to being a boy and just have some fun. I am reducing Pilates and dry needling, and I will be making my own schedule for exercise. In just two weeks, I will be leading our scout troop on a canoe trek up in the Boundary Waters Canoe Area…no way to ride a road bike up there….but I might do a trail run or two. My wife and I are intending to teach a course at our church, and I will be using lots of the time that I have historically been spending exercising to prepare for and teach the course. We are already debating positions on food issues, and the whole family is involved in the discussion. The area that I most need to improve is nutrition, and this will only help. Expect some blog entries on nutrition and nutrient timing in the not too distant future, as well as a guest blogger or two. Jeff, I really enjoyed your posts on the Dualathon, Family & what’s ahead. We will pray for a good rating outcome that will take you to Austrailia. Whatever happens, the awesome thing to remember is that you were very successful in doing your BEST! WOO-HOO, WTG!! Linda P.